This list is made in no specific order. Built by Khedive Ismail in 1869 to host Empress Eugenie, wife of Napoleon III, as the guest of honor for Suez Canal Inauguration, interior-ally designed by a German designer, with over a million exotic species planted by a French landscaper. 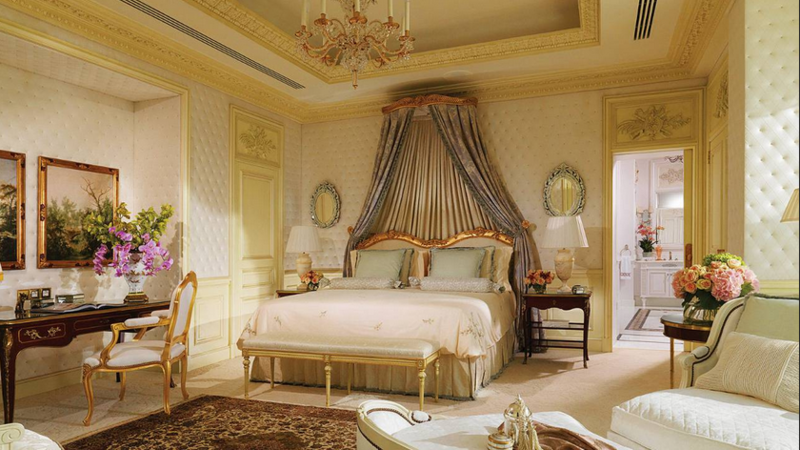 The Palace went through several phases, but since 1970 it has become a 5 star luxury hotel with up to 1250 guest rooms and luxurious amenities. This is where Royalty is experienced at its best, and its Christmas decorations are among the best in town. This where history, arts & luxury meet. 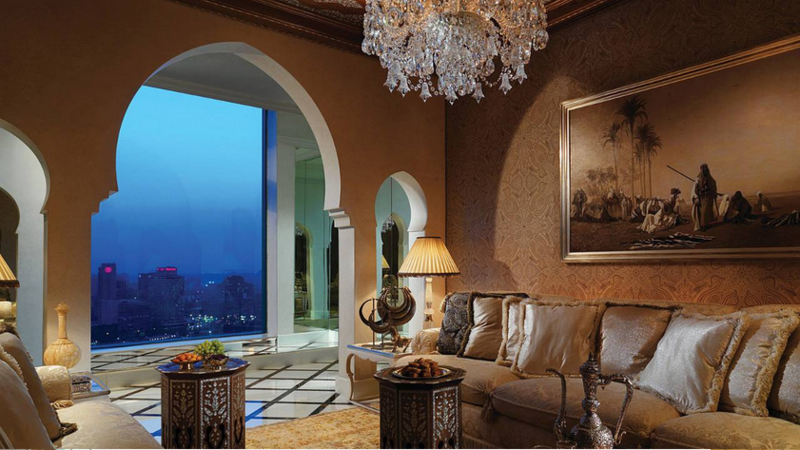 Not only it’s the first, but the only luxury boutique hotel in Cairo; offering dazzling views of the Nile River blended with European charm & elegance. This is the perfect escape from the hustle and bustle of noisy Cairo, its location speaks for itself, wherever you look there is no escape from looking at the Nile. Not only it has a unique view, but an infinity pool which seems to spill into the river, and a variety of restaurants and cafes all facing the Nile. A sophisticated resort offering you all the pampering that you need in their unparalleled spa. It’ another hotel with a great location overlooking the Nile River, the location is kind of central, so close to the city center, and only 15 minutes away from Maadi. With eight glamouring choices for dining or entertainment. It’s not close to the Nile, or in central Cairo, it’s a hidden gem in the heart of Islamic Cairo. 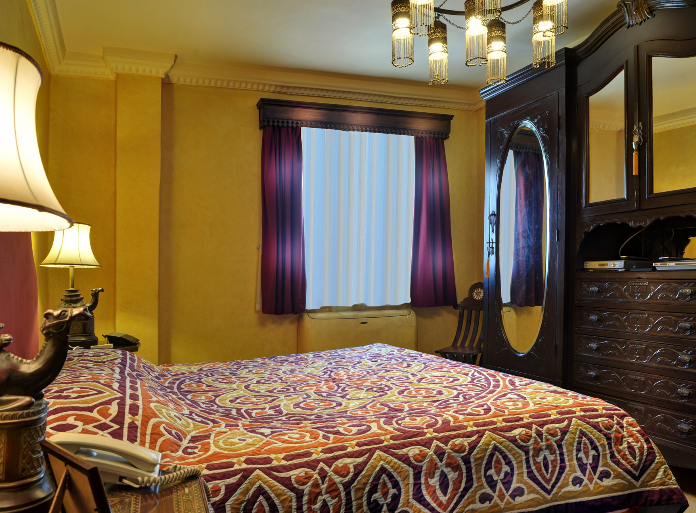 Le Riad is inspired by the surrounding environment and architecture, and has an authentic Old Cairene architecture, all in warm colors, Fatimid fabrics, local talented paintings dating back to the era of architectural, music, lifestyle and love. 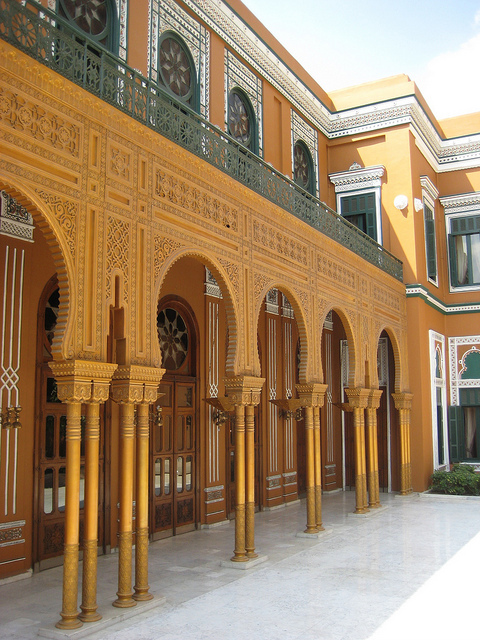 This place travels you back in time, and takes you to another impressive Egyptian era. Located in a newly developed city in Greater Cairo, it’s a lush oasis of greenery and lakes in the heart of New Cairo, infused with traditional Thai design. 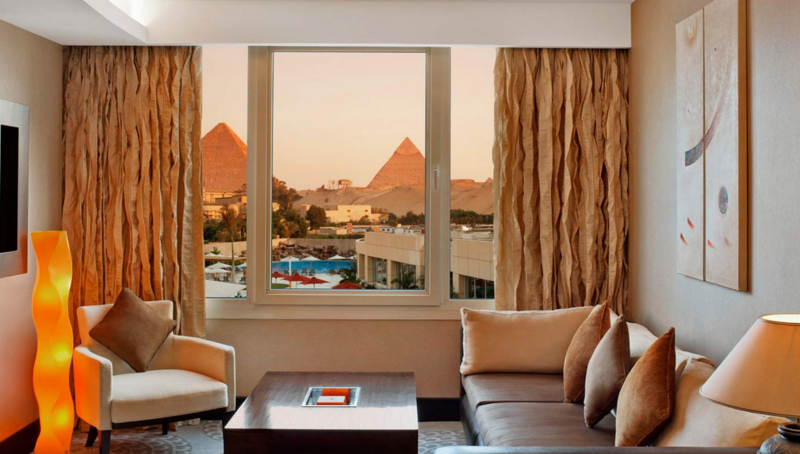 Dusit is only 20 minutes from Cairo International Airport, with two outdoor swimming pools, a jacuzzi, a well-equipped fitness center and an array of fine dining options spanning a world of tastes and flavors. Initially a hunting lodge built in 1869 for King Ismail Pasha, offering dazzling views of Giza Pyramids and hundreds of acres of greenery. The Mena House Hotel is another proof of the Royalty that once existed in Egypt, & is one of Egypt’s landmarks. Another hotel offering dazzling views of the only wonder of the 7 World Wonders that is still standing till that day & largely intact, in addition to a wide selection of restaurants and cuisines offering a mouth-watering experience to food lovers, a Royal Club floor, a magnificent swimming pool, and spa amenities. Located at a convenient location only 20 minutes from the city center, when there is no traffic -which is a rare thing :). 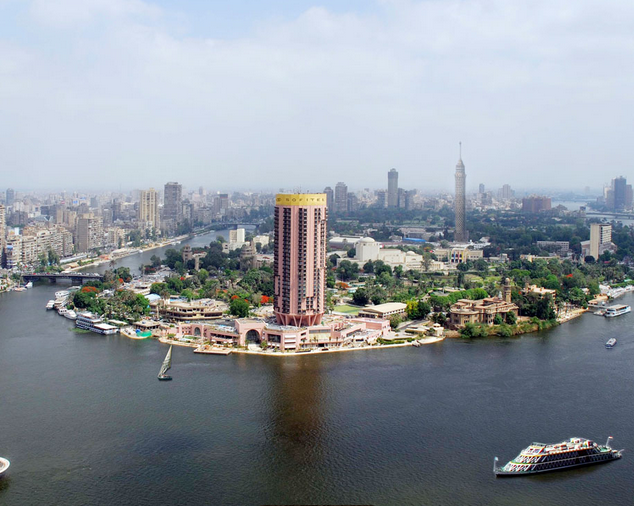 Only 30 minutes from the Sphinx & Giza Pyramids, having a prime rooftop overlooking the Nile which includes a restaurant, and an outdoor swimming pool. Dance your heart out at O Bar, indulge yourself with delicious food coming from the heart of Asia at Saigon Restaurant & Lounge, or a “Californian grill” from Napa Grill. 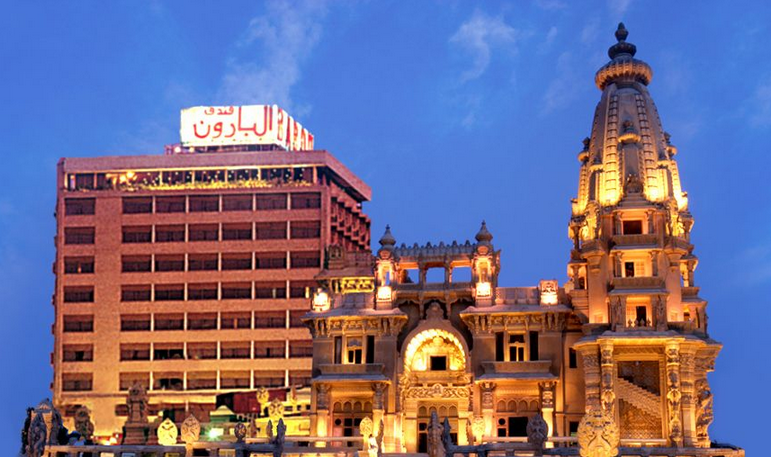 A boutique-style corporate Hotel, overlooking the famous historical Baron Empain Palace built in 1911, ideally located in the heart of Heliopolis area, one of Egypt’s high scale residential areas, and leisure districts, close to Cairo International Airport, and your starting point to explore Heliopolis area. Address: Ma’ahad Al Sahary St., Heliopolis. This is the closest you can get to Cairo Airport in the most luxurious way, as the Hotel is located a few steps away of Terminal 3 through an interconnecting bridge allowing you to walk straight from your plane into this sophisticated modern place. 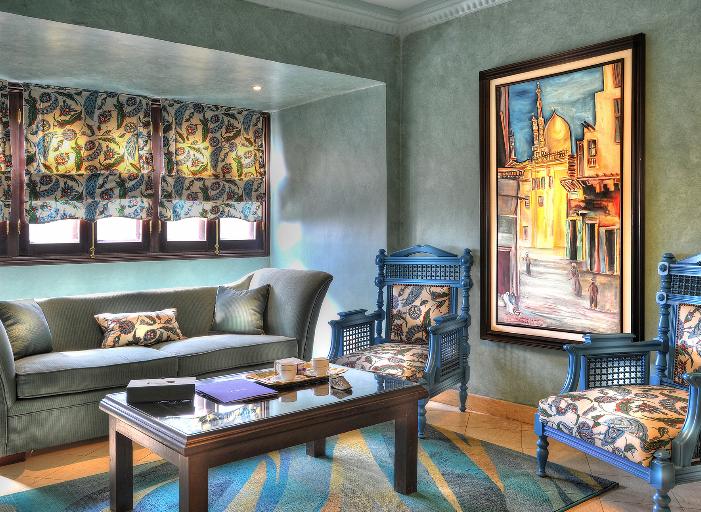 Get ready to smell loads of fresh air, as this is the first non smoking hotel in Cairo. Voted as Cairo’s Best Business Hotel, located next to one of Egypt’s biggest shopping centers Stars Mall, not far from Cairo International Airport. The hotel makes everything possible, from steak to sushi, from spa treatments to squash, and from complimentary Wi-Fi to cocktails on the air-conditioned poolside terrace. Yes, What about Semiramis Intercontinental!!! !